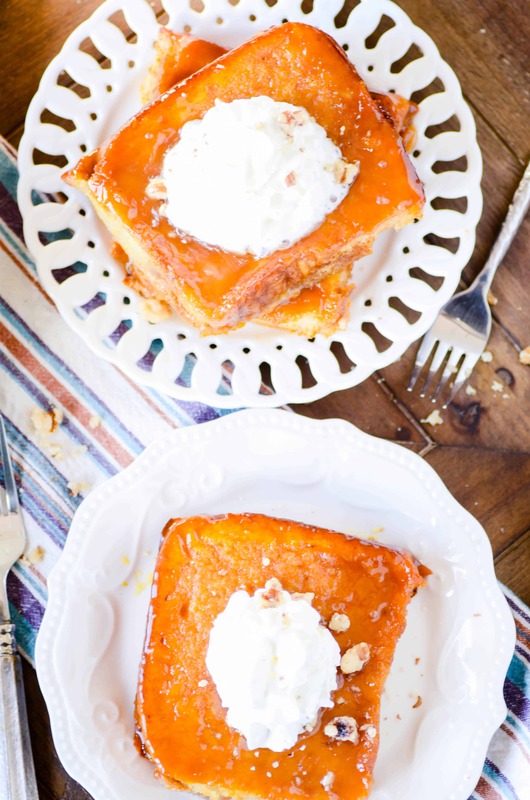 This Pumpkin Baked French Toast is the perfect recipe for a cozy Fall breakfast. So easy too! Before I was a parent, I swore that my kids were never going to be picky eaters. ???? insert all the eye-rolling emojis here. Seriously. Are there stupider (yes, stupider, I said it) thoughts out there than all-knowing parenting expertise from people who aren’t parents? I mean, really. What was I thinking?? Who on earth honestly believes that they can control what their child is going to eat or not eat? Sure. We can choose what food options we give them. But let’s get real. The truth of the matter is that my daughter can go on a hunger strike for longer than I’m willing to not feed her. So now I have a picky eater. As it turns out, however, she loves pumpkin. But not my Emma. In some rare moment of bravery, she tried pumpkin pie a few Thanksgivings back, and it’s been her favorite dessert ever since. In fact, no matter the season, if I let her pick the dessert for family night– it’s always pumpkin pie. Will she eat mashed potatoes? No way. Mandarin oranges? Absolutely not. Teeny-weeny-itsy-bitsy-practically-invisible green flecks of Italian seasoning in her pasta? Maybe. When hell freezes over. But cold squash pie? Oh suuuuuuuuuuure. Any day of the year! Regardless of how super weird it is that she adores pumpkin even though I can’t get her to touch a french fry, I’m with her on Team Pumpkin when it comes to this French toast. 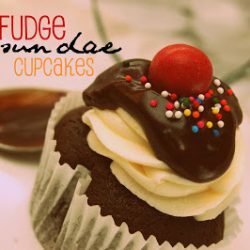 It’s really easy to make. And it’s baked, so you don’t have to make it on the griddle (which is always messier in my opinion). So, big points for me right there. 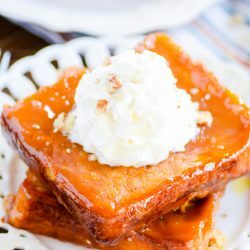 It’s baked in a CARAMEL SAUCE. 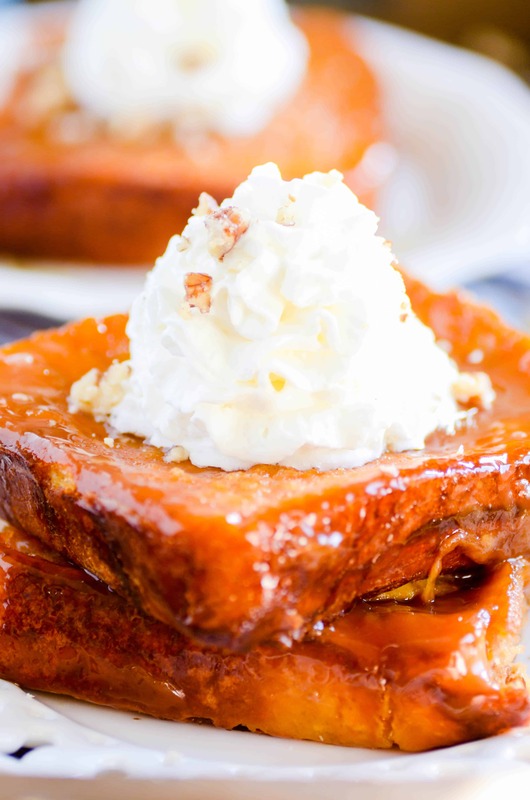 Let me repeat that: this pumpkin French toast is baked in C-A-R-A-M-E-L sauce. As in, it’s absolutely drenched in caramel. Do I need to really elaborate this point any farther?? Lastly, it makes your house smell so freaking good. Like Fall, but better somehow. Because it combines the smell of fresh baked bread and pumpkins spices and caramel all in one. 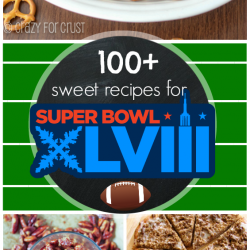 It’s like the trifecta of ultimate baking smells. Speaking of that freshly baked bread smell… you don’t really have to make homemade bread for this. I like to use homemade bread, because it tends to be thicker and denser than store-bought which is fabulous for absorbing all the liquid before baking. But you could definitely use a thick store-bought bread as well. However, I’d recommend steering away from the bread aisle and instead purchasing bread from the bakery section of the grocery store. A nice, sturdy French loaf, challah, or even sourdough would work really well here. 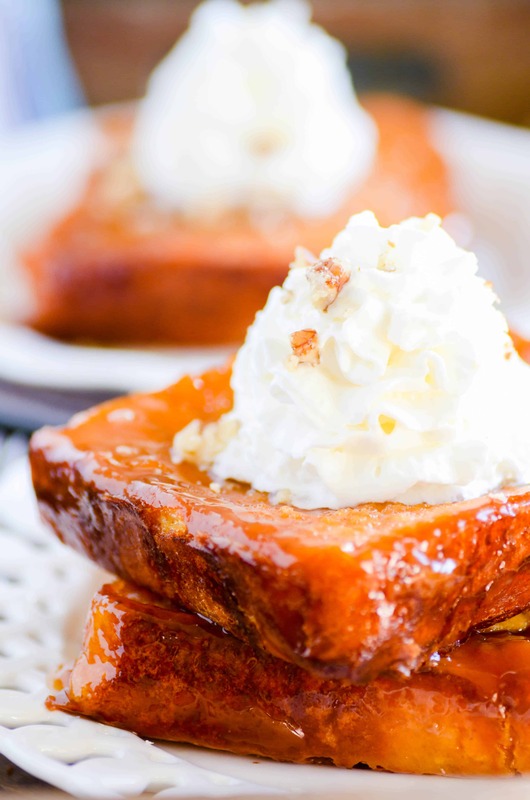 All you have to do to get this bit of Fall breakfast deliciousness in your home is a bit of nighttime prep. Slice up the bread and pour on the milk-pumpkin-egg mixture at night before you go to bed. Stick it in the fridge so that the bread has time to soak up all that liquid. In the morning, you’ll make the caramel sauce. Which is not near as daunting as it sounds. Basically, you’ll melt together some butter and some sugar. Seriously, that’s it. It does it’s thickening in the oven, so that’s not going to be your job! 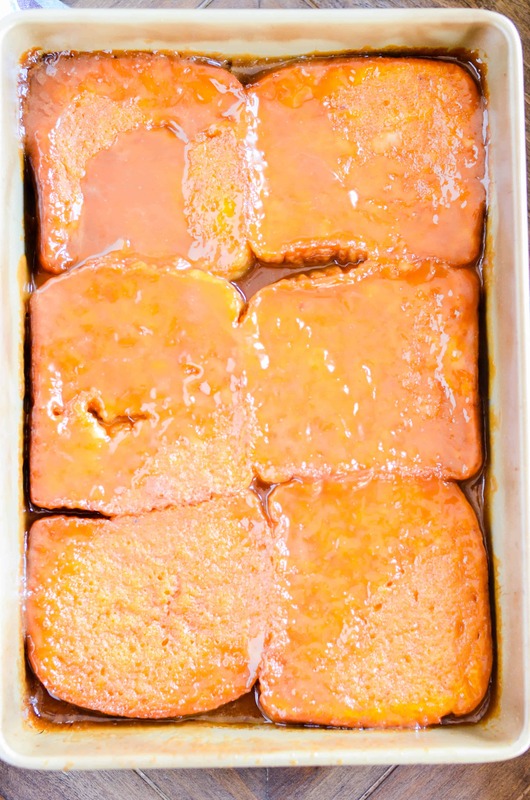 Pour it over the bread, pop it in the oven, and 40 minutes later your house will smell like pumpkin caramel heaven, and breakfast or brunch will be ready. You can skip the syrup (thanks to the caramel) and go straight for the whipped cream. 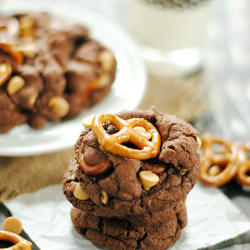 Add a little hot chocolate or apple cider, and voila. A breakfast fit for October champions ????. 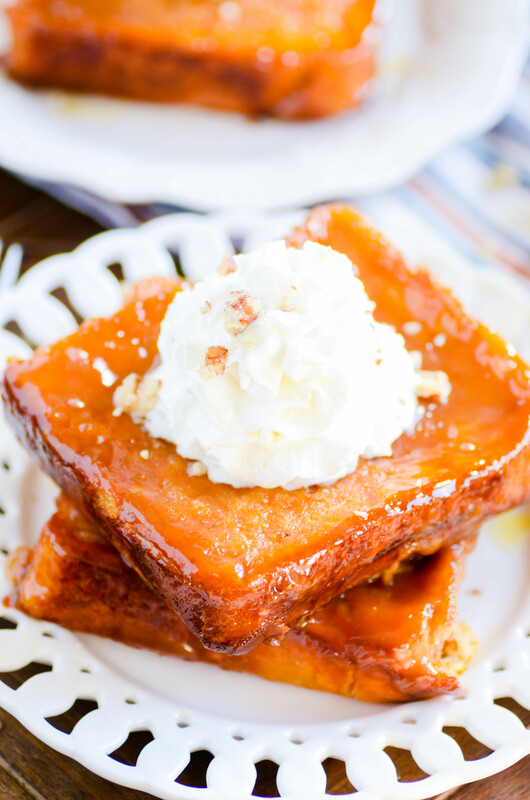 This Pumpkin French Toast is the perfect recipe for a cozy Fall breakfast. So easy too! Lightly grease a 10x15 or 9x13 baking dish. Evenly layer the slices of bread in the bottom. Whisk together the eggs, milk, pumpkin, vanilla, and pumpkin pie spice. Pour mixture over the bread slices, ensuring that every piece gets moistened. Cover and chill overnight. In a small saucepan over medium-high heat, melt together the butter, sugar, and corn syrup. Heat and stir until bubbling. Pour over the soaked bread (spread with a spatula if needed). Let rest for about 10 minutes before serving warm!